Overall, the impeller pump family includes several “turbine” pumps. These include the horizontal-shaft diffuser pump, and the vertical-shaft deep-well centrifugal pump. 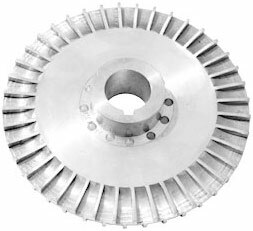 Turbine pumps can also be subcategorized as vortex, periphery or regenerative turbine pumps, based on the shape of the blades that impart energy to the liquid, and the direction of the liquid as it leaves the blade. Fig. 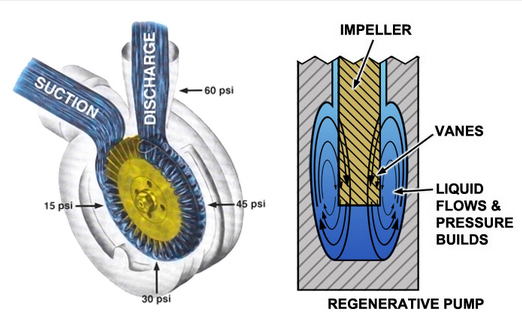 1 – The fluted impeller is the hallmark of a regenerative impeller pump. Through centrifugal forces, this impeller propels the fluid radially outward. The enclosing channels direct the fluid into twin vortices around the impeller blades, also shown in Figure 2. Fig. 3 – As fluid moves form the inlet to the outlet, pressure mounts continuously in the vicinity of each impeller blade of the regenerative turbine pump, with subsequent passes though the impeller channels adding energy to the vortex. This energy manifests itself as pressure.